I love baking. 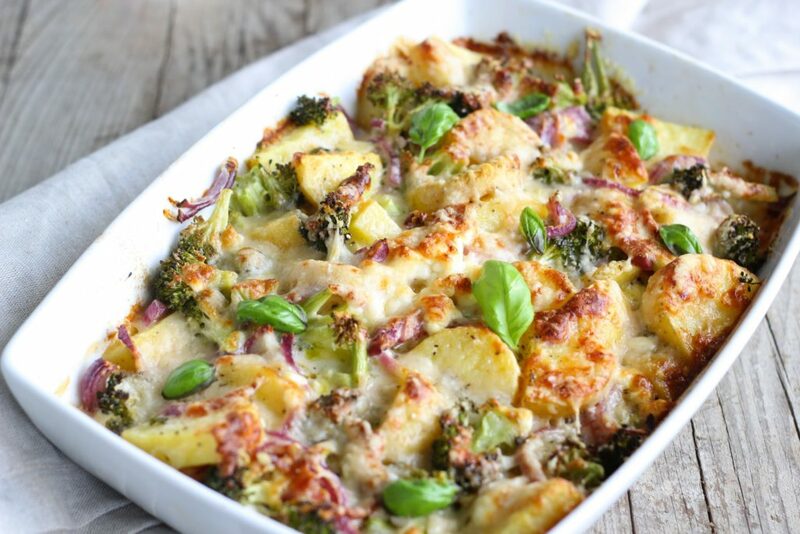 I make a baked savoury or dessert dish every alternate weekend. When I started off, I used to make use of my existing utensils. However, gradually I realized the importance of having dedicated bakeware in my kitchen. I have tried and tested multiple brands over the last few years. And hence wanted to share my experience by writing this blog post on my picks of the Best Bakeware Brands in India. To be honest, not a lot of people bake on a regular basis in India. Accordingly, you will not find as many options and quality brands as you will find in some of the western countries (especially online). However, there are still enough option to choose from. I will now start listing down some of my preferred brands below. Note – You can also use cast iron cookware for baking. However, I have not included them in this article of mine, as I have a sperate dedicate article for the same. Do Read – Best Cast Iron Cookware in India. I could not find a single brand (online) that would suffice my requirement of all the bakeware that I need. Hence, I have listed a few brands that I prefer and the cookware that I buy from them. While baking it is essential for you to have the right mixing bowls. You will also need some good quality baking dishes as well. I usually prefer to buy my baking dishes with lids so that I can use the same glass dish to serve my guests. Borosil provides you with unmatched quality and style. The glass is high grade and will last you really long if taken good care off. I am still using some Borosil bowls that I bought 7 years ago. They still look as good as new. 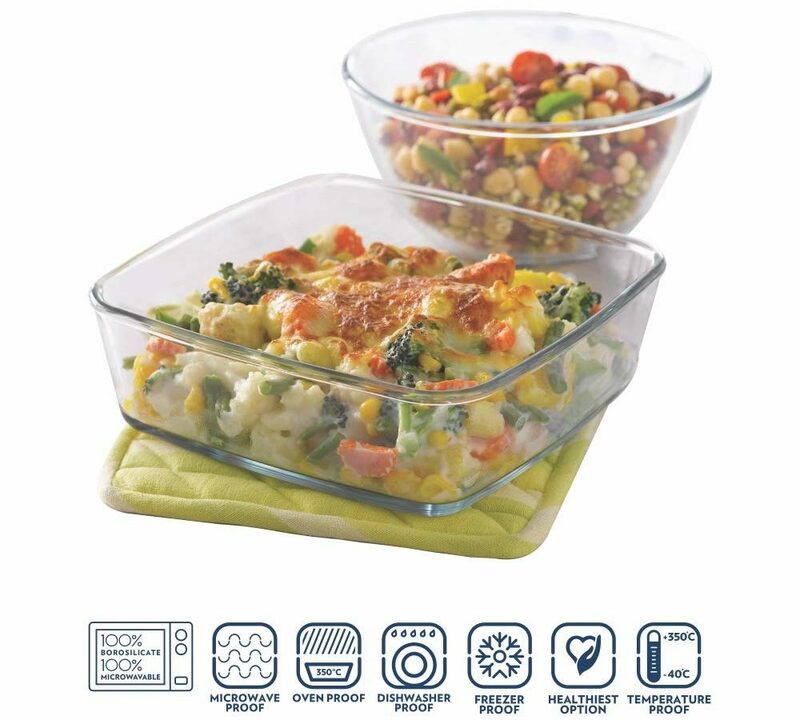 The square baking dish with lid is a nice addition to your cookware. You can bake pasta, chicken or fish dishes in it and also use it as a serving bowl. 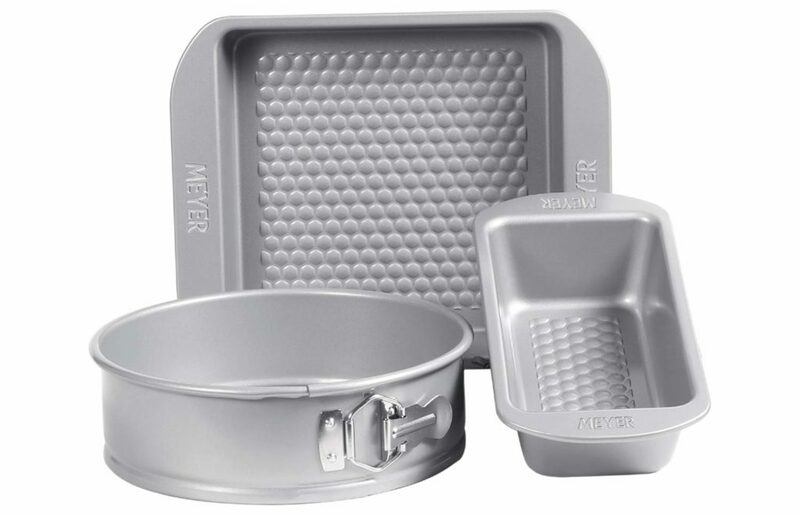 If you are looking to buy cake tins, metal moulds for cupcakes or bread or simply baking trays for cookies, Meyer is one of the top brands that you can buy online in India. 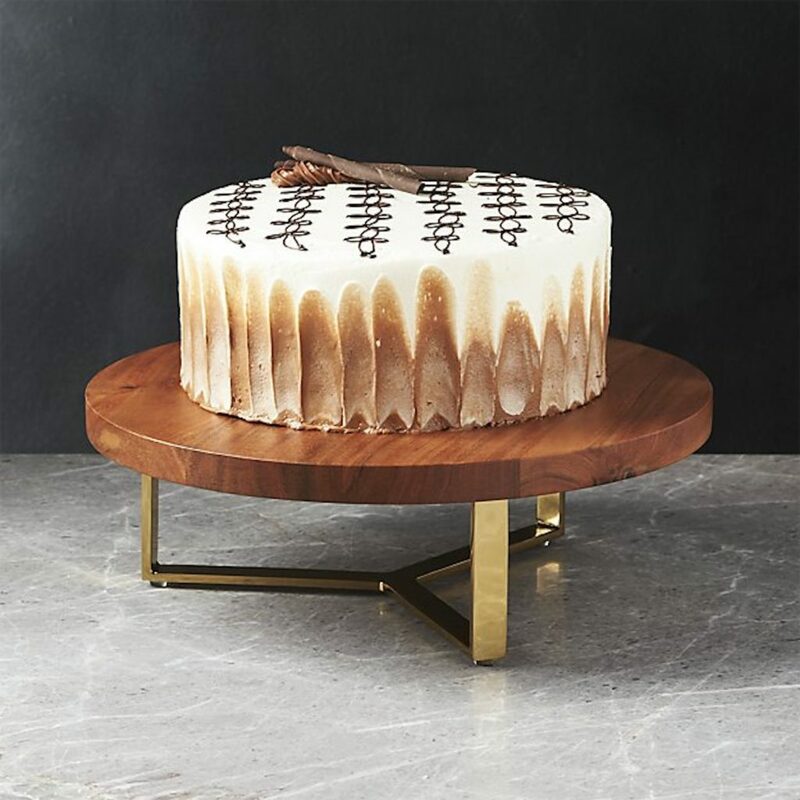 They might appear a bit expensive compared to other local brands but do consider that most likely you will not need to buy a cake tin again because this product by Meyer will most probably last you for a lifetime. So, given a choice, I will always go better quality product that will help me bake better. Most Meyer products come with a honeycomb pattern at the bottom of the tin (check the image above for reference). This drastically improves its non-stick capabilities and also provides better browning to your cake. 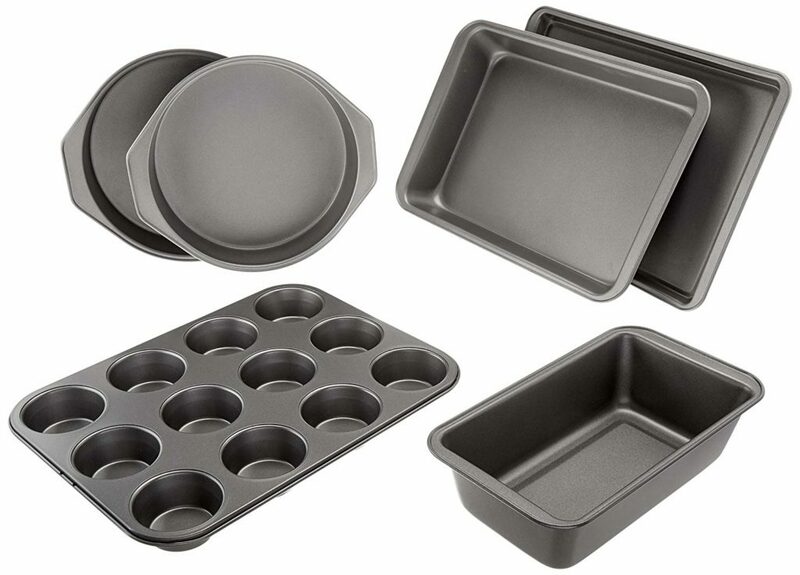 They also offer some “not so easily” available products like a baking pan for pizza & square shaped cake moulds. 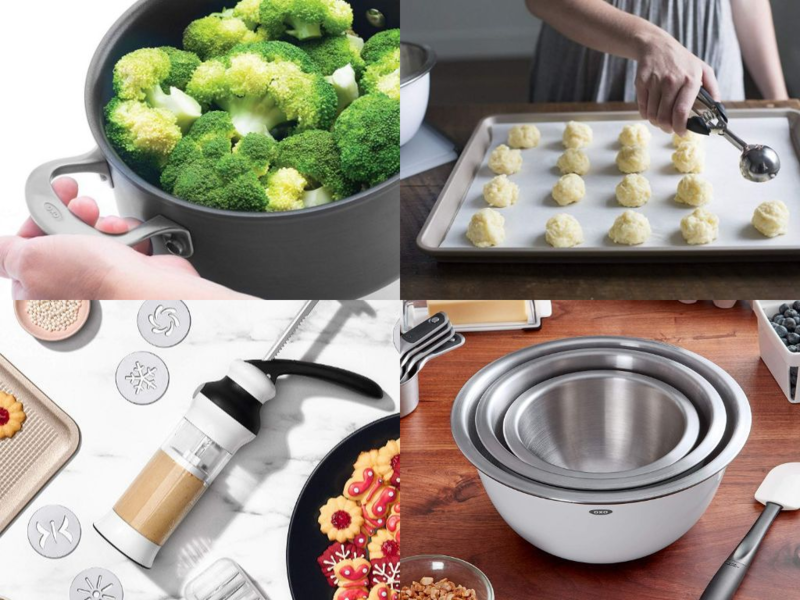 Oxo is a US-based brand specializing in Bakeware. OXO’s parent company is called “Helen of Troy” and is listed on Nasdaq. They also have a major presence across the UK, Japan and Germany (Apart from the USA). If you are looking to buy professional grade Icing knives, pastry brush, mixing bowls, cooling racks or cookie scoop, this is the brand to look forward to. I must admit that OXO baking cookwares are expensive and not everyone would want to buy them. I mostly buy smaller items from them. Following are the items that I buy. Cookie Scoop – Not many brands offer a good cookie scoop. The cheap ones don’t even last for six months. Hence if you are looking to bake some uniform cookies, do invest in an OXO product. Whisk & Brushes – I find their wishes and pastry brushes quite good. You can buy slightly cheaper ones as well (recommended below) but OXO ones feel good while handling them. Amazon Basics is the next brand on my list of Best Bakeware Brands in India. This is a private label brand owned and operated by Amazon. So, you can rest assured that the quality of the products will good (in line with the price that you pay). AmazonBasics has a wide range of products in the Home and Decor category. Right from bed sheets, knife sets, curtains to chef knives. At the time of writing this article, Amazon Basics had a good range of baking trays and cupcake moulds on sale. The price of the products is very competitive. I have not personally tried these products but given that the brand is owned by Amazon, I am sure the quality would be good. You can use the link provided above to check the entire range on offer. Do check out other products like bedsheets as well. So, a lot of people would get surprised to see the name of the last brand on my list. Not many people would have heard about NestRoots. I have tried a couple of products from them and found the quality really good. This brings me to the end of my article on the Best Bakeware Brands in India. I really hope you are able to select the right cookware for baking. So, which one did you decide to buy? Did I miss out on any of your favourite brands? Do let me know in the comments section below.